Wolverhampton, for example, in the heart of the Midlands was never a classic picture postcard town. I suppose mainly through its industrial background, but it is a typical example of how buildings with character have disappeared in many rebuilding programmes. Planners and the councils endorsing their decisions, in the late 1950s through the 1960s seemed to go berserk in their passion to rebuild- and some might argue destroy- what were historic and delightful areas in which to shop . Increasing road traffic clearly they say, forced their hand – and introduced us to the pedestrian precinct , an American term if ever there was one! THE WOLVERHAMPTON INNER RING-ROAD Is no Friend of Mine! The route taken by the line of the ring- road as it cut through the heart of North Street. With the making of the ring road this very famous carriageway leading down from North Street to Waterloo Road disappeared . 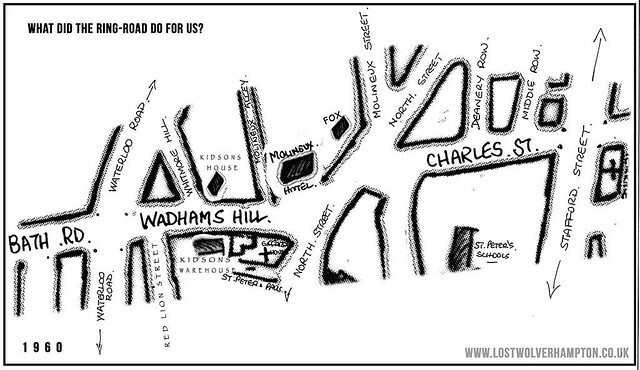 Its name was one of the oldest on record, and in the middle ages it was occasionally spelled ~ Waddam’s and Otham’s Hill. This small extract is from the 1880 Ordnance Survey Map of Wolverhampton. 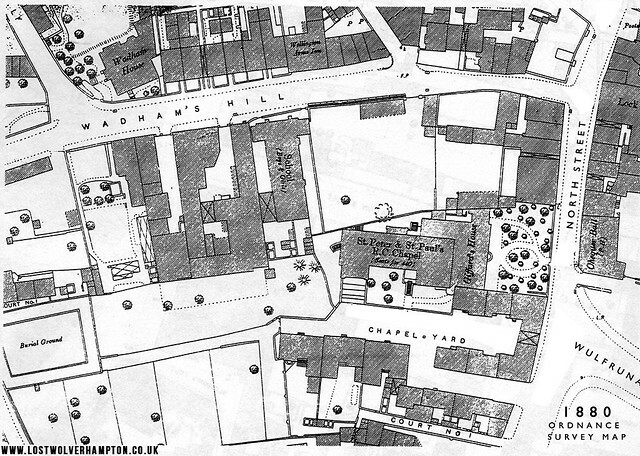 This small extract is from the 1880 Ordnance Survey Map of Wolverhampton and it shows the buildings of interest adjacent to the Hill at that time. No.1 at that time was the majestic “Wadhams House”. Wadhams House became the home of the Kidson Family. Wolverhampton Grocers. On this view looking up the hill from Waterloo Road from the 1950’s, the car is parked in front of the house at the end of Whitmore Hill a small carriage way leading off it; also into Waterloo Road. Whitmore Hill though on Isaac Taylors Map of 1750 was then was the start of the main route from town to Whitmore Reans along Whitmore End Lane later to become Newhampton Road. This distinguished Victorian house , was for many years the residence of a branch of the Kidson family. General Grocery Provisioners, who between the wars right up to the early 1960’s owned two shops, and a large Warehouse in close proximity to their family home opposite on Wadhams Hill. I don’t recall the actual date the Kidson family came to live at Wadhams House , but according to the Wolverhampton Red Book,dated 1932, W.S Kidson was listed as being at No.1 Wadhams Hill and I do know for a fact at the time this photograph was taken a Mrs Edith Kidson lived here as I delivered her news papers. You will notice the cyclist passing Kidson’s the home is approaching a row of terraced villa’s, which amongst them (as seen on the previous Ordnance Survey Map ) stood the Wellington Public House, owned by Butlers Springfield Brewery. The large tree belonging to Mrs Brown at No 7 Wadhams Hill seems to be growing out of the canopy fronting the “Wellington Inn”. 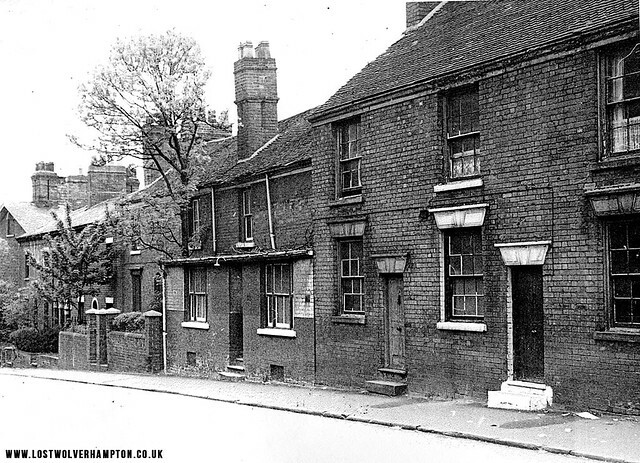 Three steps led up into the old hostelry and around the time of the photograph it was still in the hands of the Yeomans family who had held the licence for many years, by 1960 though it was an empty shell. At end of the small row of terraces at the top of the hill and North Street was Molineux Alley, on the left of which was a confectioners and on the right was The Molineux garage. 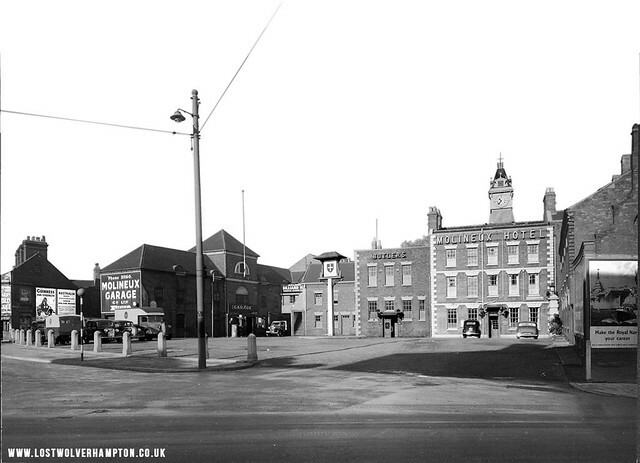 A Panoramic view of the forecourt of the Molineux Hotel circa 1940’s. The row of billposters on the hoardings opposite the Molineux hotel. 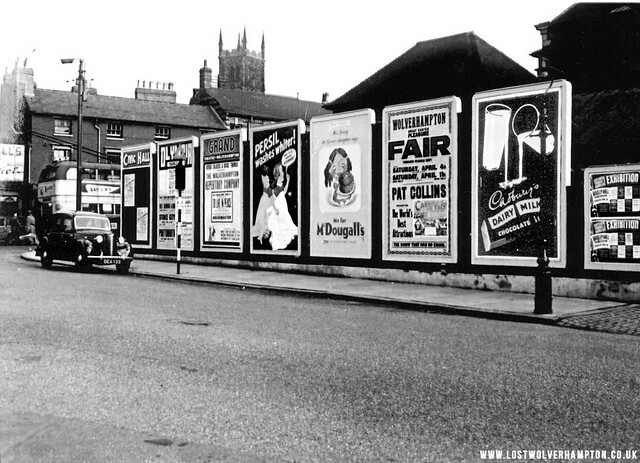 To put you more in the picture regarding the top of Wadhams Hill – we see the returning Fordhouse’s trolley-bus alongside Woodhalls shoe repairs and on the opposite side of the Hill going back down , was the Catholic annexe to Giffard House, fronted by this row of Nostalgic billposters advertising the town attractions that week in April 1953. We see Pat Collins is again appearing on Brickkiln Patch. Easter week, with the Worlds Greatest Attractions. Equally as popular then was the announcement that “The Ideal Home” exhibition was returning for its annual visit to Bingley Hall Birmingham. A rather poor snowy scene taken with a box brownie circa winter 1954. 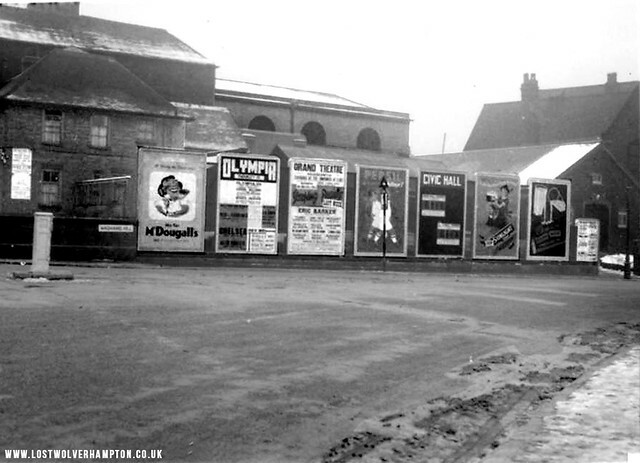 Now looking at the hoardings taken in the 1950’s from the top of North Street, fronting Molineux Fold. on the left we see the Catholic Presbytery of St Peter & Paul’s Church. On the billposters we notice Eric Barker is the top act in a revue at The Grand Theatre, and at the end of the hoardings the snowy covered Milner Hall peeps out above the Cadbury’s Chocolate advert The Milner Hall, named after Bishop Milner. I recall was well known for its old time dance nights at that time. Next to the hall was the rear of St Peter and St Paul’s School, the frontage of the School being in Paternoster Row. 34-35 Wadhams Hill south side Kidsons Warehouse and managers house. Beyond the School were the large gates, giving access to R R Kidson’s Warehouse, at 35 Wadhams Hill which backed on to Paternoster Row. mentioned earlier. We and then a row of houses which led around into Red Lion Street, these houses were occupied mainly in the fifties, by Policemen’s families, from the nearby station, (Wadham’s Hill, was 300yds long, and led from Bath Road, across Waterloo Road into North Street.) 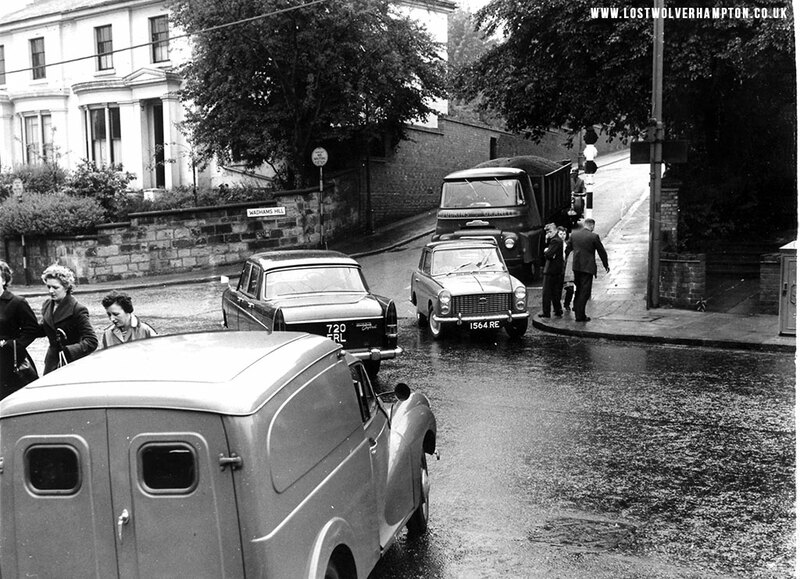 and as you can see by the traffic was a busy junction even then in 1960. The Waterloo Road / Wadhams Hill Junction 1960. It was as I recall the main route through town from the direction of Cannock via Stafford Street then a choice of Camp Street or Charles Street into North Street down Wadhams Hill and Bath Road into Chapel Ash. for all directions West. 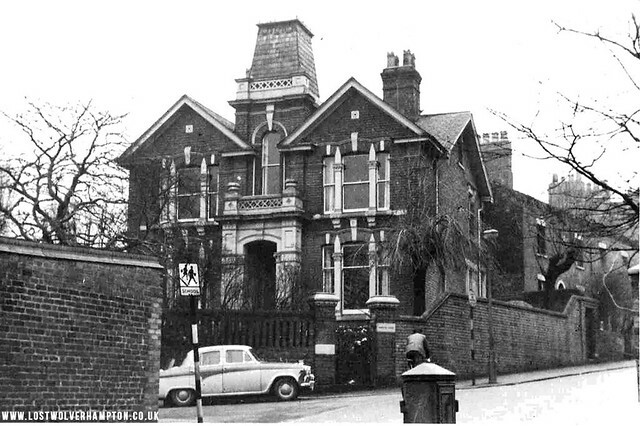 Besides losing Wadhams Hill through the emerging Ring-road we also lost those wonderful Victorian Houses either side homes of one time eminent solicitors and professional men from the local hospitals. 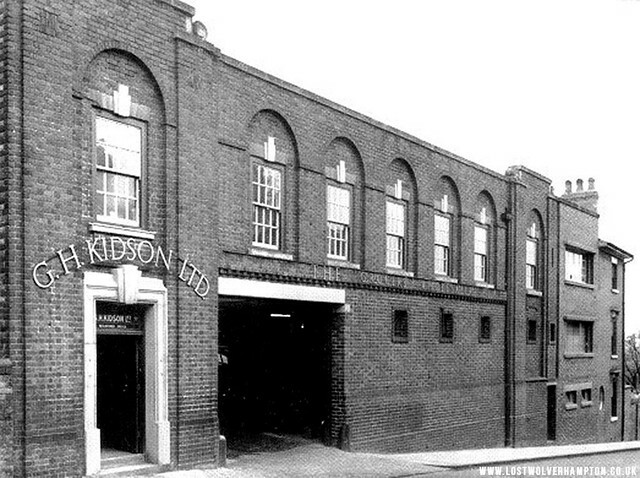 It is noted in the 1965 Kelly’s directory though that G.H.Kidson Wholesale Grocers are now trading from Walsll Street inbetween York Street and Commercial Road. Pictured in 1974, what was once Wadhams Hill. Even Peal House (The large building on the left has now gone) leaving us a car-park today in 2015 ) Wadhams Hill that ancient Street is unrecognisable today from the one I recall from my youth it is now completely devoid of any character. 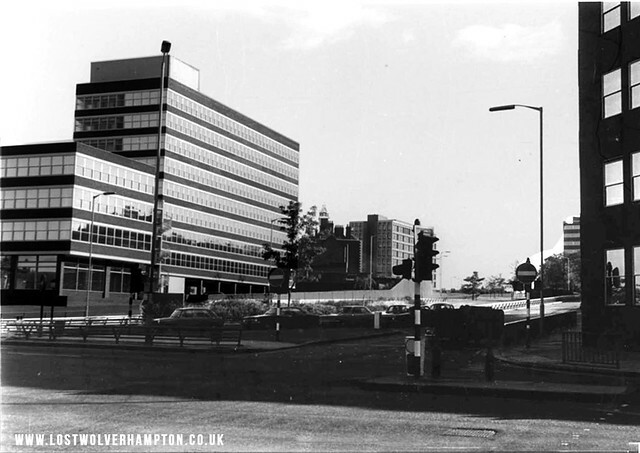 The former Molineux Hotel and its illustrious companion the Church of St Peters and Pauls fronted by high retaining walls and divided by this busy road. I am afraid there’s nothing left for me of days that used to be, there are just my memories that I will continue to share with you. And what wonderful memories they are too, A big thank you to you Bill for sharing them with us, for without your hard work none of us would be able to enjoy, much appreciated. Come on you people, SPREAD THE WORD.! Lost Wolverhampton. Thank You chaps for those encouraging comments. please keep in touch. The landlord of the Wellington Arms Inn was my Great Grandfather, Henry Daniel Yeomans, and my father (also Henry Yeomans) was born there. He took over the licence from his father in law John Cherrington Barratt after he married his daughter Nellie. Can’t do that today ,they’ve swept it all away, along with those streets, I held dear. Billy, Are you doing any talks this year please ?. I only do daytime talks now Mike mostly for Dementia Care Groups I shall post the dates and times of future talks on the Forum and on our Facebook Group. We lived in a big house on the right side of Wadhams hill in about 1962 (I think) I was only about 4 but remember the house well, there was a rockery in the front garden and the back garden seemed huge. My Dad used to keep an eye on a warehouse next door with vans inside (the old Commer vans I think) I used to climb onto the wall at the front and watch the football supports going up the hill. My younger brother was born there and I started school at St Judes walking down an ally opposite the house to catch a bus. Nice one David Glad we stirred some pleasant memories for you.